Large pub, decent service, not too busy. Nice window seat watching the cars go by. Do food but did not try it. Not what you might expect entering the pub from the John Street end, a very big room more like a city centre pub than most in Harrogate. Beer wise a keg range much as found anywhere although maybe a little more choice, and two well kept cask beers, local lads Daleside and Copper Dragon on my visit. Multiple big screens on various different channels spread round the room with lots of table and chair style seating, the tables have brass numbers for food orders but I didn't eat here. The staff are young and seem a bit inexperienced hence some short measures here but there are enough of them to cope with reasonable customer levels even if some of the punters are a bit dodgy looking. Nothing much to praise or complain about. There is a pool table at one end and live music here every Thursday which is a good thing in itself. Very large pub with entrances on both Prospect Place and John Street. 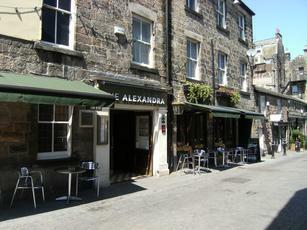 Sells a decent range of changing cask ales, usually with one or two interesting microbrewery beers. Majors on sport and food, there are loads of TVs all around showing all the live matches. Not very impressed with the food as it was slow coming, was nowhere near as good as it sounded and was overpriced for what you get. You can hardly get through the door at weekends and the clientele are a bit boisterous to say the least. Not really my type of place.